PREFACE TO THE HOLY CATHOLIC BIBLE. "Among the many and great blessings which God has bestowed upon his Church, by means of the sacred Council of Trent, we may justly reckon this as one of the greatest, that out of so many Latin editions of the divine Scriptures, he has declared, in the most solemn manner, the ancient Vulgate alone to be authentic, which had been approved in the Church, and used during so many hundred years. For, not to mention that many of the late editions seemed to have been falsely translated, on purpose to maintain the heresies of the present times; so great a variety of contradictory versions was undoubtedly calculated to introduce great confusion in the Church of God. For, at the present period the same inconvenience is observable, which was noticed by S. Jerom (praef. in Jos.) in his time; I mean that there were as many different works as there were copies, tot fuise exemplaria quot codices; as each person allowed himself the liberty of inserting or leaving out what he thought proper. The authority, however, of this old Vulgate edition, was always so much superior to that of any other, that no equitable judge can entertain a doubt, but that it deserves to be preferred before them all. For the books which are contained in it, as it has been handed down to us by our ancestors, have been received partly from the version or correction of S. Jerom, partly retained from a very ancient Latin edition, which S. Jerom styled the common and the Vulgate (in C. 49, Isai.) S. Aug. the Italic (De doc. Chri. ii. 15.) and S. Gregory the old translation (Ep. ad Leand. C. 5.) Concerning this old or Italic edition's superior accuracy, there is still extant the glorious testimony of S. Aug. in the second book of Christian Doctrine; where he says, that in his opinion the Italic deserved to be preferred before all the numerous Latin editions which were then in the hands of the public, because it adhered closer to the words of the original, and delivered the sense in a clearer manner. The ancient Fathers have moreover frequently spoken in the highest terms of S. Jerom, whom S. Aug. (above, and de Civ. 18. 43.) styles a most learned man, and one perfectly acquainted with the three languages; and he shews that his translation is accurate, from the testimony of the Jews themselves. S. Gregory extols the same person in such a manner, that he says, his translation, which he calls the new one, is more accurately taken from the Hebrew in all respects than any other; and hence upon it, we may entirely depend. (Mor. 20, 24.) S. Isidore likewise in many places gives the preference to S. Jerom's version, before any other, and testifies that it was generally received and approved of by the Christian Churches, because the words were more expressive of the genuine meaning of the text. (Etymol. 65.) The learned Sophronius, perceiving the approbation which was given to it, not only by the Latins, but also by the Greeks, was so much taken with it, that he gave an elegant Greek version of S. Jerom's translation of the Psalms, and also of the Prophets. The men most eminent for learning in the following ages, Remigius, Bede, Rabanus, Haymo, Anselm, Peter Damian, Richard, Hugh, Bernard, Rupert, Peter Lombard, Alexander, Albert, Thomas, Bonaventure, and all the rest who have flourished in the Church for these nine hundred years, made use of S. Jerom's version in such a manner, that all the others, though they could hardly be numbered, being almost entirely neglected by Divines, have become obsolete. Hence, it is not without reason that the Catholic Church speaks in such exalted terms of S. Jerom, 'the greatest doctor, divinely raised up to interpret the sacred Scriptures;' and it will be no rash or difficult matter to censure the judgment of all those who either do not acquiesce in the learned labours of so renowned a doctor, or even have the boldness to think that they can offer something better, or at least equal, to the public. However, lest this very accurate translation, which has been found of so very great service to all parts of the Church, should in any degree be adulterated, either by the injuries of time or by the negligence of printers, or by the rashness of those who undertake to correct without sufficient grounds, the same most sacred Council of Trent added very wisely to her decree, that this same ancient and Vulgate edition should be printed with all possible accuracy; and that none should be allowed to print it without the permission and approbation of superiors. By which decree, she at the same time set bounds to the licentious temerity of printers, and excited the vigilance and industry of the pastors of the Church to preserve with all vigilance so great a treasure. And although the Divines of some celebrated academies had acquired much applause by their attempts to restore the Vulgate edition to its ancient beauty, yet, as in a matter of so great importance, too great diligence cannot be exerted; and many MSS. of the greatest antiquity had been procured and brought to the city by the order of the Pope; in a word, as the execution of decrees of the General Councils, and the integrity and purity of the Scriptures, belong in a particular manner to the care of the apostolic see; hence the sovereign pontiff, Pius IV. watching with the greatest diligence over every part of the Church, commissioned some chosen Cardinals of the Holy Roman Church, and others who were the best acquainted with sacred learning and the various languages, to correct the Vulgate Latin edition in the most accurate manner, after having examined the most ancient manuscripts, the Hebrew and Greek original texts of the Bible, and the commentaries of the ancient Fathers. This plan was pursued by Pius V. But when, on account of the many urgent occupations of the apostolic see, this learned body had not met for a long time, Sixtus V. being called by divine Providence to the high priesthood, assembled them again with all diligence, and ordered the work, which was at last brought to a conclusion, to be put to press. When it was printed, and the same Pope was about to send it forth into the world, perceiving that not a few mistakes had crept into the Bible by the fault of the press, which seemed to require a more diligent revision, he judged it expedient, and determined to begin the work afresh. But as he could not execute this his design, being prevented by death, Gregory XIV. who, after the 12 days pontificate of Urban VII. had succeeded Sixtus V. in compliance with his intention, undertook to perfect what he had begun, and again deputed some eminent Cardinals, and other learned men, for that purpose. But he also, and his successor, Innocent IX. being taken out of this world, in a very short space of time, at last, towards the commencement of the pontificate of Clement VIII. who now governs the Universal Church, the work which Sixtus V. had intended, by the assistance of God, has been brought to a conclusion. "Receive then, Christian reader, by the consent of the same pontiff, Clement, from the Vatican press, the ancient and Vulgate edition of the sacred Scripture, corrected with all possible diligence, which though indeed it be difficult, considering human weakness, to assert that it is absolutely perfect, yet that it is more correct and pure than any which till this day have been published, cannot admit of any doubt. And truly, though in this revision of the Bibles, no small pains have been taken in examining the manuscripts, the Hebrew and Greek originals, and even in comparing the commentaries of the ancient Fathers, yet in this Vulgate reading, as some alterations have been designedly made, so also some passages which seemed to claim the same privilege, have been purposely left unchanged. The reasons for so doing, are because S. Jerom frequently admonishes us (Ep ad Sun. & Fret. praef. in Evang.) that this is a necessary precaution to avoid offending the people: besides, we may easily believe that our forefathers, who gave Latin translations out of Hebrew or Greek, were in possession of better and more correct copies than those which are come down to us, which being often copied out, in such a length of time, have perhaps lost something of their purity and correctness: and finally, because it was not the intention of the sacred congregation of most eminent Cardinals, and of other very learned men, who were set over this work by the holy see, to undertake any new edition, or by any means to correct or rectify the old translator, but merely, by removing the mistakes of former transcribers, and the corrections improperly inserted, to restore the same old and Vulgate Latin edition, as far as possible, to its pristine integrity and purity; and to do their utmost endeavours, after it should be thus restored, to have it printed with all accuracy, in compliance with the decree of the General Council. Moreover, in this edition it has been judged expedient to insert nothing but the Canonical books, every other work of human industry, as foreign to our purpose, being removed at a distance; and this is the reason why the 3d and 4th books of Esdras, which the Council of Trent did not number among the Canonical books, and even the prayer of King Manasses, which is extant neither in Hebrew nor in Greek, nor in the more ancient MSS. nor forms a part of any Canonical book, have been place out of the order of the Canonical Scripture. Besides, there are not here to be seen any concordances in the margin, (which in future editions are not forbidden to be inserted) no notes, no various readings, no prefaces, no arguments at the beginning of books. But, as the apostolic see does not condemn the industry of those who in other editions have inserted concordances, concordantias locorum, (or what may help to remove apparent contradictions in the text) and also various readings, prefaces of S. Jerom, and other things of the like nature, so she does not forbid these helps for the advantage of the studious being inserted, in a different type, in future impressions of this Vatican edition, provided the various readings be not marked on the margin of the text itself. This is the Preface originally prefixed to the Vatican edition of the Vulgate. As it contains an abridgment of the Bull of Sixtus V. and gives some account of the pains which have been taken, and of the means adopted, to give a correct edition of this so much admired Vulgate, we thought it could not prove unacceptable to the English reader. The brief of Clement VIII. dated 9th Nov. 1592, in the 1st year of his pontificate, shews the solicitude of his Holiness that this work should descend unadulterated to posterity; and hence he prescribes due limits to the enterprise of printers, and calls upon the vigilance of pastors to prevent any corruption or change being inserted by private authority. This is unquestionably the meaning of those general prohibitions inserted in the Brief, as well as in the Bull of Sixtus V. where this limitation is expressly inserted. "We forbid, in the most decided manner, any person to undertake the impression of the text of a new Vulgate edition of the Bibles, without the express leave of the Apostolic see. Neither let any one dare, or presume, to frame a different edition to suit his own private or peculiar judgment..." They never intended to control future Popes, over whom they could claim no such authority; as they would enjoy the like sovereign power as themselves. Hence if, at any future period, any material improvements should be discovered, by the unremitting labours of the learned, they will be at liberty to authorize them to be adopted; neither can they entertain the smallest apprehension of their infallibility being endangered on this account, nor fear the cavils of Protestants, who, in imitation of Thomas James, (d. 1629) may perhaps amuse their deluded admirers by a sequel to his Papal war. Had the doctor rightly understood the Bull of Sixtus V. and the decree of the Council of Trent, when it defined the Vulgate to be the only authentic Latin version, it is probable he would have spared himself the trouble of shewing that there were many variations in the two editions of Sixtus V. and Clement VIII. However, leaving the doctor and his admirers to their own discretion, we cannot but applaud the labours of these great pontiffs for the good of the Church; and we are glad to find, that some of the most learned even of the Protestants, join with us in extolling the accuracy of the Vulgate. I will only mention the learned Mills at present, as his authority must have considerable weight, particularly in this country, to which his labours and judgment have done so much honour. "We look," says he, (Proleg. in N. Test. p. 142) "upon the old Italic version with sovereign respect.... We are also far from saying any thing against the Vulgate edition of S. Jerom.... We are so far from thinking that it ought to be corrected by any printed Greek copy, that we are persuaded no more essential service can be rendered to it, than by correcting it according to the ancient MSS. that by this method it may become, as much as possible, similar to that which S. Jerom published." To acknowledge, as Drusius has done, (ad loca dif. Pentat.) that the Vulgate is a good translation, and superior in point of authority, to those Latin versions which had made their appearance before the decree of the Council of Trent was promulgated, is all that the Church requires; and this, no equitable judge, who has compared them together, will surely ever deny. One thing ought particularly to make it dear to all Christians, that it was composed so many years before the late dissensions about religion took place; and that by men who cannot be said to have been biased on either side, and who are revered as men of sound doctrine, both by Catholics and Protestants. That the Vulgate was composed by the inspiration of God, as the originals certainly were, no person asserts; neither do Catholics maintain that it is actually free from every imperfection, much less that it was so at the time of the Council of Trent, 1546, April 8th, when the famous decree was made, 46 years before the Clementine edition was given to the public. Since the last correction, many alterations have been proposed by Lucas Brugensis, whose work is published in the 4to edition of Du Hamel. Bellarmine, who was one of those celebrated Cardinals employed by Clement VIII. to revise his edition of the Vulgate, Baronius, and N. Alexander, in their annals, &c., point out several amendments which might still be made. None of them, indeed, affect the faith or morals of Christians; but still they deserve attention, as nothing can be esteemed little with regard the word of God. Hence, in the notes which will accompany this edition, the most important amendments at least will be noticed: not that we mean to reject the Vulgate, or to take upon ourselves the right of deciding that they ought to be admitted, but only in imitation, and by the authority of so many great and good Catholics, to promote the cause of God, by separating what may be called in question, from his most sacred and undoubted revelation. See Philip's C. Pole, ii. 17. Bellarmine, Diss. &c.
Hence, though we have occasionally consulted some of the heterodox versions and commentators, in points of criticism; yet it has been with fear of deception, and we have dwelt upon the works of Catholic authors, both with greater pleasure and advantage. To obviate the misinterpretations of the may heretical works which disgrace the Scripture, and deluge this unhappy country, has been one main design of the present undertaking. In our endeavours to explain the Vulgate, the notes will be selected from commentators of the highest respectability, whose names we shall mention, at least in matters of any importance, or where any of them has suggested an explanation, striking and peculiar to himself. To adhere on all occasions to their very words, or to attribute to the first inventor every observation, we do not suppose will be requisite; neither would the trouble attending such researches, or expense of printing so many names, be compensated by the utility. We shall subjoin at the end of this preface the names of those who have been chiefly consulted. 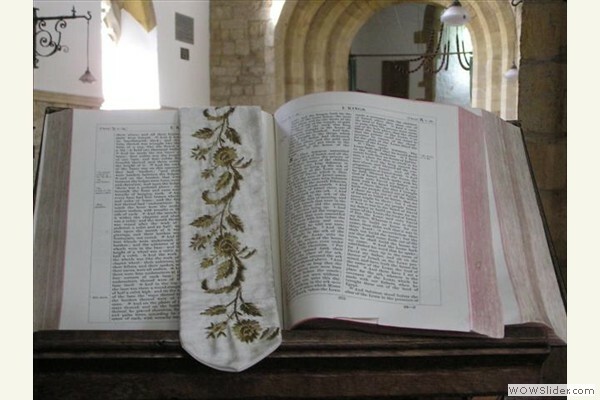 Little Greek or Hebrew will be inserted; the latter will only be given in English characters, expressing each Hebrew letter by such as are adopted either in the Rabinical, or in a new method of reading Hebrew without points. The English letters which here correspond with the Hebrew alphabet, are, a, b, g, d, e, u or v, z, e, t, i or j, c, l, m, n, s, a, p, ts, k, r, ss, th. Of these, six are vowels, a, e, u, i, long e and a: But u and i are also consonants before vowels; the other 16 letters are consonants, and are pronounced, when many come together, by inserting o; thus m l c, must be moloc, a king; also the name of an ancient idol, e d k, edok, a thorn; ari, a lion; Jeve, the Self-existent Being, pronounced Jehovah by moderns, though without reason. See Amama, p. 319. This method frees....the student from the perplexing difficulties of the Massorets, and allows him time to improve himself in things which may be of far greater service. The invention of Hebrew points, is allowed by all good critics to have been a work of too late a date to be of any great authority; and when we reflect that by these points the Jews have frequently rendered passages obscure, which were favourable to the Christian religion; we ought to be upon our guard how we find fault with the versions of S. Jerom, and of the Septuagint, who were acquainted with them. This observation will also serve to point out the cause of the many different versions of the same passage in the ancients, and of the wonderful conformity which is observed among the modern interpreters. The accents and spirits in Greek are not of greater authority; they are entirely omitted in the famous Alexandrian MS. of the Septuagint, (not to mention others) and are also neglected in the Complut. Polyglot; because they were not found in the MSS. which were consulted, nor indeed are they in any of those which are most esteemed for their antiquity. We do not deny but that they may be of some service, as well as the Hebrew points; but they cannot stand their ground in a dispute, or make the victory declare for either party, as their origin is certainly human. Punctuation, though nearly of the same nature, must not however be altered to favour heresy or to pervert morals, which has sometimes been the case. Thus the Socinians read, John i. 1. "and God was. This word was," &c. instead of the word was God; and libertines read, 1 Cor. vii. 36. let him do what he will he does not sin; if he marry. In all these things let us cling invariably to the doctrine of the Church, and receive the bread which she breaks for her little ones with gratitude and submission; she invites us to take into our hands the sacred volumes, and to meditate on the, day and night: she cautions us indeed against the false translations and comments of heretics, whose doctrine creepeth as a cancer. But she assures us, that there is nothing to fear from this ancient and Vulgate version, provided we receive it in that sense, in which it was first delivered, and as it has been constantly expounded by the Catholic Church, to whom alone this province belongs. To her judgment we entirely submit all our labours, and retract whatever may be found worthy of censure by her sovereign judgment. "I may fall into a mistake," says the humble S. Aug. "but I will not be a heretic." It was from the Church we received these venerable books: as the same Saint observes, "I would not believe the Gospel, unless the authority of the Catholic Church influenced me to do so." c. Epist. Fundam. And why should we refuse to receive the interpretation of all difficult passages from the same unerring source, the ground and pillar of truth? 1 Tim. iii. What has Marcion, Luther, or Wesley to do in her field? she possessed it first; she received it from those Apostles to whom it certainly belonged. No; the gates of hell itself shall not prevail against her. Christ is with her all days; his Holy Spirit is sent purposely to guide her into all truth which is necessary for man to know. Search then the Scriptures under her guidance, (Jo. v. 39.) in which, as S. Peter admonishes us, (2 Pet. iii. 16, 17.) are some things hard to understand, which the unlearned and unstable wrest...to their own destruction. You therefore, brethren, knowing these things before, take heed, lest being lead aside by the error of the unwise, you fall from your own steadfastness. If you read in this spirit, the Scriptures will prove a book of life, the covenant of the Most High, as it is justly styled in Ecclus. xxiv. 32. This is the book of the commandments of God, says Baruch, and the law that is for ever; all that keep it, shall come to life; but they that have forsaken it, to death. Return, O Jacob, and take hold of it, walk in the way by its brightness... We are happy, because the things which are pleasing to God, are made known to us. In a word, whenever we take this sacred book into our hands, let us bless God, who has given such gifts to men, and raising our hearts and minds to the Father of lights, and the God of all consolation, let us beg, with all earnestness, that we may read for our improvement in all virtue, and neither be deceived by misunderstanding what we read, nor lead others astray. Non decipiar in his, non decipiam ex his. S. Aug. Come, Holy Spirit, &c. Let us never forget those memorable words of the Prince of the Apostles: We have also the more firm prophetical word, whereunto you do well to attend, as to a light that shineth in a dark place, until the day dawn, and the day-star arise in your heart. Understanding this first, that no prophecy of Scripture is made by private interpretation; for prophecy came not by the will of man at any time, but the holy men of God spoke, inspired by the Holy Ghost, 2 Pet. i. 19, 20. --- This Book of God, as the Arabic version styles the Book of Genesis, as the head of all the Scripture, this Book of Wisdom, shall praise her own self, shall glory in the midst of her people, and shall open her mouth in the Churches of the Most High... I came out of the mouth of the Most High...as a cloud I covered all the earth...come over to me all ye that desire me, and be filled with my fruits, &c. Ecclus. xxiv. 1. &c. H.